Alright friends, it's time for a poll: what's your all-time favorite Thanksgiving side? My family hosts Thanksgiving for my aunts, uncles, grandparents, cousins, and anyone who's around and needs a place to eat and celebrate and feel thankful. So my brother and I would serve up our plates & eat reasonable portions while everyone was over for dinner, and act like normal humans. We'd have a little dessert, because it's Thanksgiving after all. Then as soon as everyone left- it was on. 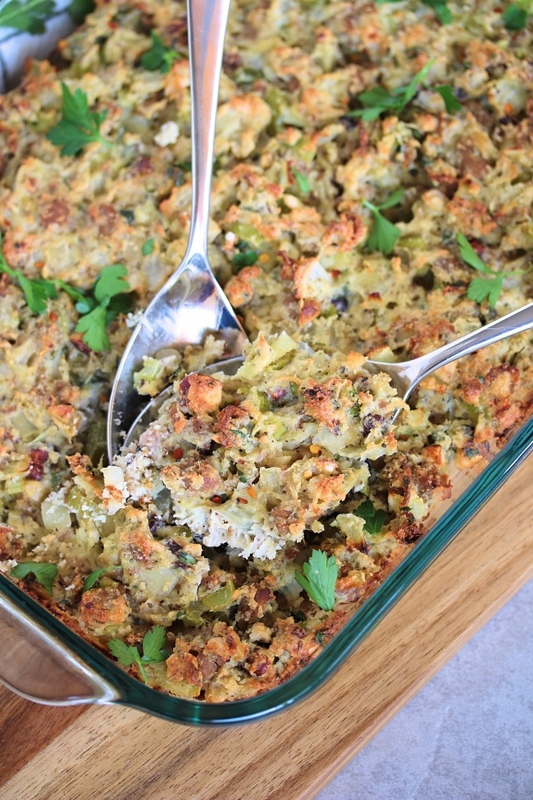 We'd each grab a bowl and serve up seconds of thirds of what we really wanted: more stuffing! It was always the first "leftover" to disappear. And when I say stuffing, I guess I technically mean "dressing"- although no one in my family ever called it that, so it just sounds weird! 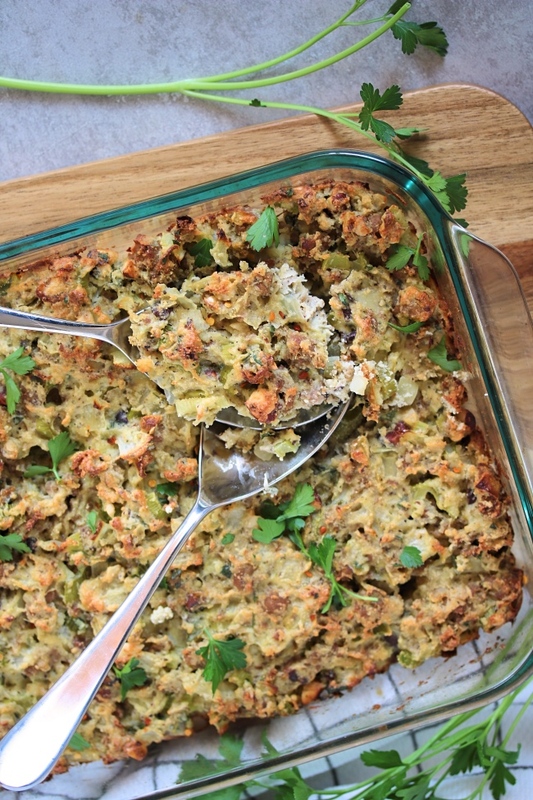 My family used to do a half & half batch of stuffing, where half would actually get stuffed in the turkey, and the other half would get baked in a casserole dish until crispy & delicious. Both styles would be set out for our feast, and I feel like no one ever picked the smushy one cooked in all the juices from the turkey. But maybe I wasn't paying full attention-- all I know is that the crispy, baked kind is my jam! And in recent years, we just go straight for the baking dish and get it ALL crisped up and perfect. 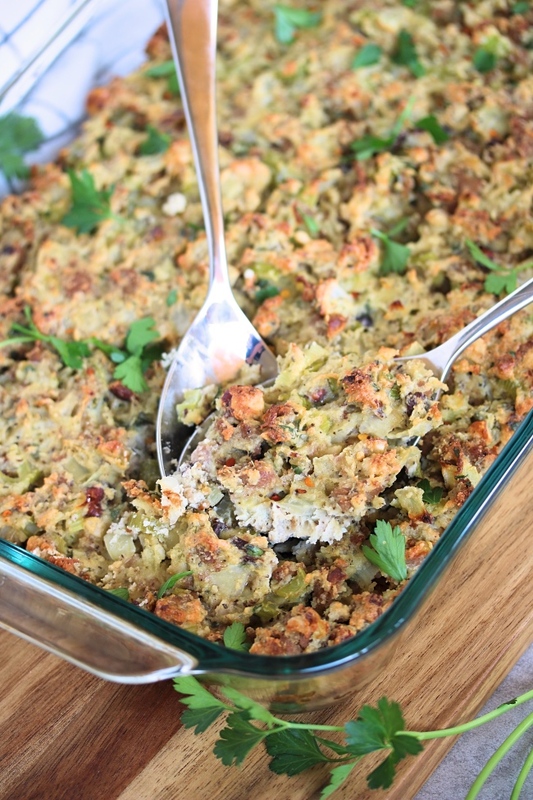 Are you a "stuffing" or "dressing" person? No offense if you like the stuffed kind of stuffing by the way, haha! Another personal preference thing: what actually goes in your stuffing. Ours always had an Italian flair (I think we got this passed down from my dad's side) with Italian sausage and black olives. I omitted the olives for this recipe because I thought the masses might find it weird- but they really do add a great savory, salty flavor. We would buy the chopped kind! However when we'd go over to my aunt & uncle's house for Christmas, my aunt would make more of a sweet version with apples and cranberries (or was it raisins?) which was equally comforting & delicious, but just different! So like I said, personal preference. 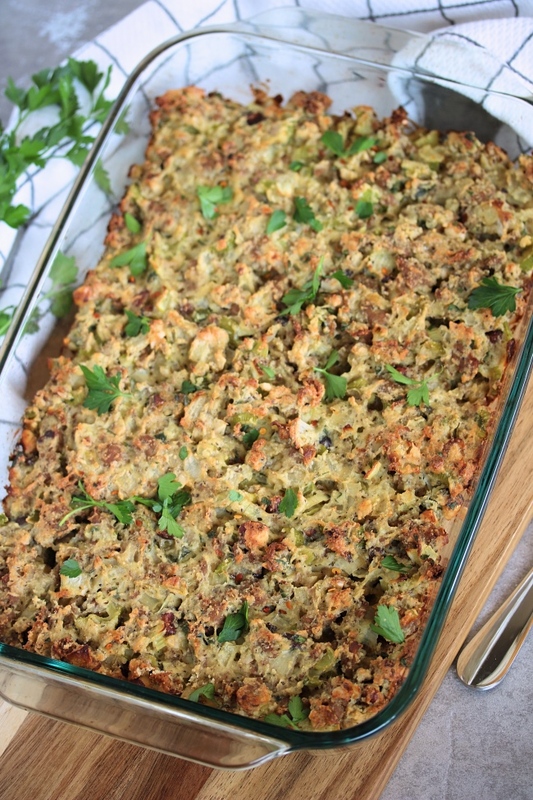 Use my recipe here as a guide to get that stuffing flavor and texture without any grains or bread required, and flavor it up the way you and your family like. I've got notes below to guide you, but you can make it meatless, or sweet, or savory sausage style like I do! You do you, and enjoy this tasty side- whether it's for Thanksgiving or any time of year, I think you are going to love it! Preheat the oven to 350ºF. 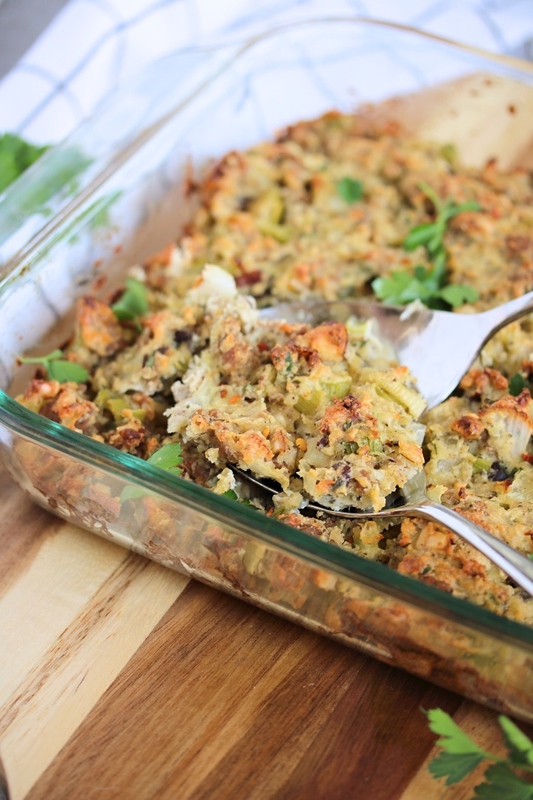 Grease a 9" square baking dish or any casserole-style dish with ghee. In a large skillet over medium heat, cook the sausage until broken into crumbles and just browned. Add the chopped veggies and 2 Tbsp of ghee, and cook until the vegetables are soft (about 10 minutes). Stir in the chopped chestnuts or hazelnuts, and the herbs and spices. Season with additional salt & pepper to your liking. Add the almond flour and whisked eggs, and stir until completely mixed. Pour into to the greased baking dish, and smooth over the top. Transfer to the oven and bake for 45 minutes or until golden brown & crispy on top. When choosing your baking dish, go for a smaller 8 or 9" square dish to get a more "deep dish" style that will stay a bit more moist. 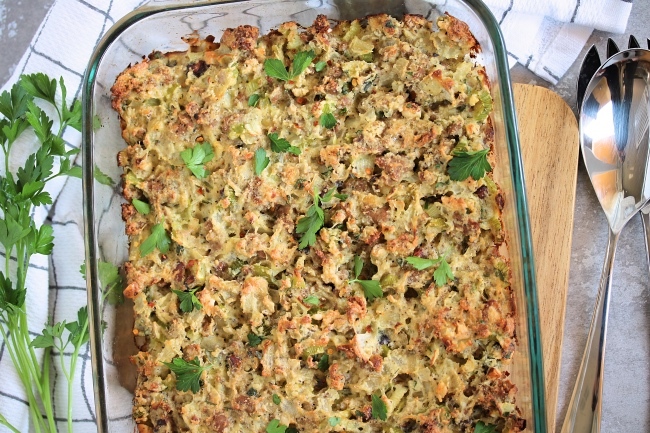 If you like your stuffing more crispy and a bit more dry (like me!) then go for a larger rectangular dish that will have more surface area exposed to crisp up in the oven! Want to make it meatless? Leave out the sausage, and go for 2 cups of chopped mushrooms instead. You can also take it a sweeter route with 1 diced apple and/or a handful of dried cranberries. If you have actual "poultry seasoning" on hand, feel free to substitute 4 tsp of that for my blend! This sounds so good... Have you tried making it a day ahead and then cooking?. I made this today, and it had a really good flavor, but it was dry. I used turkey sausage and am wondering if that’s why. I think it would have been better if I’d have added some broth to compensate for the turkey, but I will try the pork next time to see if that makes it more moist. Or would it be better to use less almond flour if using turkey sausage? Hi!! You are the first person who's mentioned that it's dry, but also the first I've heard that's used turkey sausage (which is less fat than the pork in the recipe). If you feel like it's dry before going in the oven, you can always add some broth- I'd do 1/4 to 1/2 cup to start. It might also just be a personal preference thing (I don't like a wet/mushy stuffing but prefer it to be more "bready"), so feel free to add the liquid as needed, to your liking! Hope this helps!